Shepherd's Bush, London. Well, what's left of it anyway! Yeah. These days it's known as part of the A3220. That's a bit of a come down, isn't it? Can you show me where it was on a map? What did you mean earlier by "You'd better believe it"? Right, the M41 was all of half a mile long. That doesn't seem like a good answer to my question! OK, let's see now. It should have been a great deal longer, and one of the most important roads in London. Right, what do you know about the Ringways? Cut to the chase for me. OK, this was planned to be the western side of London's innermost ring motorway (hence its other name of "West Cross Route"), though the bit we see today is just "Stage I" of the plan. As you might imagine, Stages II, III and MDCCCLXXXVIII didn't get there. So where would those extra stages have gone? Rather annoyingly from a descriptive point of view, the section that actually saw the light of day is in the middle. Ah, diddums. How about starting with the bit to the north? OK then. The junction of M41 with the former A40(M) Westway shouts "unfinished!" at you in a really loud and quite irritating voice. Not only does the whole motorway suddenly shunt over onto what are blatantly a pair of sliproads, but there's also the small stubs of north-facing sliproads on the opposite side of the roundabout. Unusually, the junction was offset, so the M41 would not have passed under the roundabout, but a little to the west, following the eastern side of the railway line, obliterating pretty much everything in its path, until it got to Willesden Junction, where it would have had a massive complicated junction with the northern side of Ringway 1, the North Cross Route. Took 'em ages, that one. OK, so what about the southern bit? From the Holland Park Roundabout (which has a rather fetching water feature in the middle), the M41 would have headed generally south, with a rather odd feature: the two carriageways would be split, so that they would pass either side of the railway line - and indeed either side of Olympia station! There would then have been a junction with the A4. This would probably have been a roundabout with the M41 flying over the top and the A4 passing underneath. There is even a possibility that the M4 would have been extended to here too. It would have then passed near to the exhibition centre at Earl's Court before a junction with a short spur running to Chelsea Embankment in the area of the under construction Imperial Wharf railway station. From there the West Cross Route crossed the River Thames right next to the railway line, where it would have met the excitingly-named South Cross Route in Battersea. The whole situation's pretty rubbish, isn't it. Absolutely. Why we persist as a nation in spending loads of money on something to do it so badly is beyond me. Surely anyone with half a brain would know that building half a mile of a planned motorway is usually completely pointless, and the money may as well have been saved. Indeed, it generally managed to make things worse than before, with massive queues regularly stretching from one end to the other. However, there were attempts to do something about it. 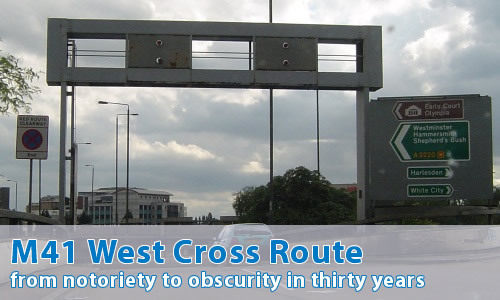 On regular basis, the West Cross Route rose from the dead, twitched slightly, becoming ever more feeble every time until the rather marvellously named "Western Environmental Improvement Route" came along in the 1980s. Realistically, if you're having to call a road an "Environmental Improvement Route", then you've got absolutely no chance of ever getting it past people. You might as well make it wear some stupid glasses and wave a large cigar around for all the good it's going to do you. As you might surmise, people saw straight through it, and it finally disappeared without trace in 1991. Anyway, what's this I hear about it having something to do with the former A41(M)? And wasn't the M41 supposed to go to Birmingham? No, absolutely not. That's an urban myth with no relevance to reality. The two motorways only share the number "41" (like M58 and A58(M)) and are in roughly the same part of the country. And neither were meant to go to Birmingham either. So why isn't it a motorway anymore? One mess-up after another. Can I see some photographs then?? There's also the tours of the former A40(M) and M41 that was formerly hosted on Apex Corner, both from the roadway, and from alongside. Of course! Contact me and I'll put them on the Comments page.